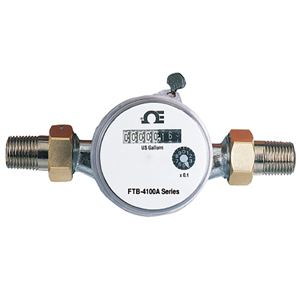 Specifically designed for water billing applications, OMEGA’s FTB-4000 flowmeters are highly accurate and feature tamper-resistant, non-resettable totalizers. The large faces are easy to read. Optional reed relay scaled pulse outputs allow for remote totalization (1.8 m (6 ft) of cable included). The pulse output option is factory installed and must be requested at the time of order. All FTB flowmeters feature built-in strainers, trickle flow indication and are shipped complete with locking nuts and coupling pieces. Max. Reading (gals): 10 million for ½" and ¾"; 100 million for 1", 1¼", 1½"
Mounting: Horizontal or vertical for ½ " and ¾" models, Horizontal Mounting Required for 1" and 1½" models. Models with suffix "-P" have a reed relay pulse output for remote totalization. 1/2" to 1 1/2" units have NPT connections; the 2" meters have flange connections.